PREHEAT oven to 350°F. Toss together Cheddar cheese, flour and pepper in a medium bowl; set aside. 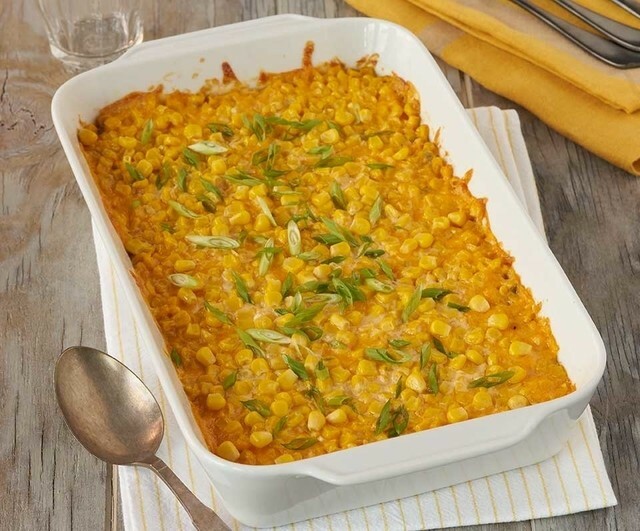 STIR together milk, cream cheese, 1/3 cup green onions and hot sauce in a 9x13-inch baking dish. Add corn and shredded cheese mixture; stir well to blend evenly. Cover and bake 30 minutes. UNCOVER and stir. Sprinkle with remaining 1/3 cup green onions and toppings, as desired. Bake 5 o 10 minutes longer.